← four hundred and fifty five. 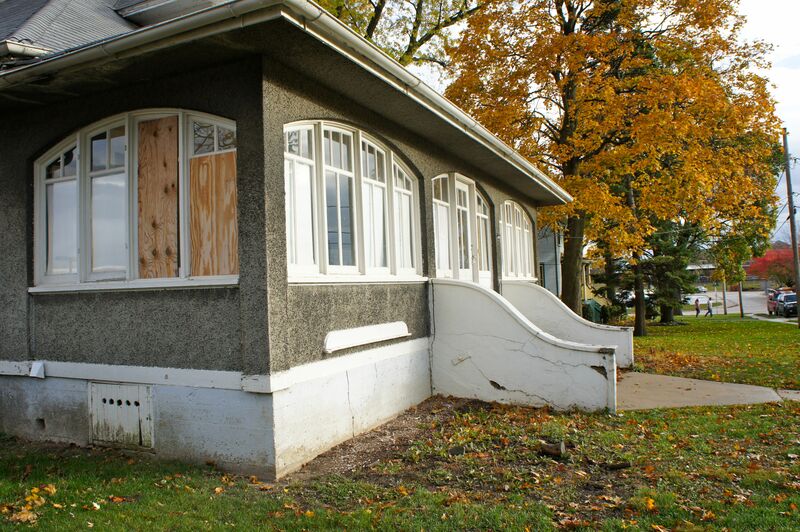 With her once beautiful glassed-in porch, the old girl sits full of woe right next-door. Some context: we live in an old house (+100 years). The house next-door to ours was built by and for the same fellow who built our home. It’s a beautiful example of a California bungalow and in truth, it’s a much grander home than ours. It happened again. At exactly 5am this morning, I awoke instantly – regaining full consciousness after having another dream about the vacant house next-door. It is a house that’s lonely and dying. The house stayed in the family of its builder until the last member (a son-in-law) died in the late ‘90s. He had sold it to a local contractor who then sold it to our (terrible/awful/no good) school district. The district, in turn, rented the property to some no-goodniks who didn’t properly care for their children who subsequently ate some paint chips, and sued the school district. Now the house sits vacant. Sometimes I think I can feel it aching. Longingly looking through its broken windows, fallen ceilings and chipping paint at our home, which we’ve spent years gently restoring and filling with love. Silly, I know – I hear the practical voice of my grandmother filling my ears, “It’s just a house after all.” But to me it’s so much more. It’s got a history. It was built with purpose and love and beauty in mind. And now it’s alone. In my dreams I am there on the day the demolition crew is there to tear it down. I’m frantically trying to save as much as I can, especially the front door, which our house can use (it’s in much better condition and I’m pretty sure it will fit perfectly). I end up with a bounty of old wonderful things in beautiful condition but eventually the crew succeeds in demolishing the old girl. I never feel good when I wake up with a start. Years ago we did try to save the house – we fought the school district on the sale and succeeded in getting better landscaping and delaying them a few months. I still despise the townie contractor who sold it them in the first place. I fantasize about winning the lottery and making the district an offer they can’t refuse and restoring the house to its original glory. Ultimately though, I know it will come down. Like most good things in life, the things you love and value most need regular care and attention. They require gentleness, appreciation, patience and time (all things that are in short supply for me). I think the house next-door dream serves as a warning that unless I slow down and am more grateful for the countless blessings I am so lucky to have, I risk them falling into disrepair or worse. And as much as I hate waking up in such a state of distress, given what it’s trying to convey, I believe I should be thankful for the house next-door dream after all. This entry was posted in Life Lessons, You gotta have friends and tagged california bungalow, count your blessings, life lessons, vacant house dreams. Bookmark the permalink.